Behold the leek! Tall, proud and full of delicate flavor. 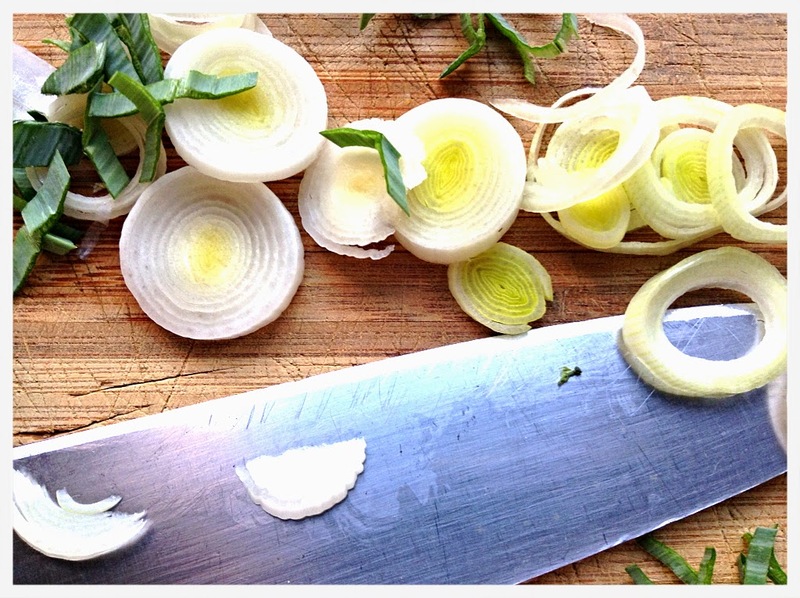 Where the onion announces its presence with bravado, the leek need not. So perfect in its subtly, when the leek makes its entrance, all taste buds stand in rapt attention. And while I hold all onions in fairly high regard, the leek has a special place in my kitchen. Pleasantly mild and sweeter than other onions, the leek is remarkably versatile and, in American kitchens, definitely underutilized. Leeks are a perfect complement to most herbs, an inspired addition to soups and eggs and are absolutely, positively sumptuous when sautéed in butter or combined with anything cream based. This somewhat indulgent tart offers both - a butter sauté and a generous helping of creamy cows milk Gruyere. Nestled in an equally buttery tart shell, it seems this recipe might skirt the edge of being a little too rich but remarkably it doesn't. Somehow amidst all that dairy goodness, there's balance. That's the beauty of leeks! Did I forget to mention the beer? Because it's a critical component to this dish's balance. Not to mention an amiable companion to the mighty leek. Something has to carve the path through all that buttery pastry dough and the hops from Goose Island's Endless IPA do so with confidence. This tart is best served after having rested for at least 15 minutes. It gives the ingredients a little extra time to really bind together. Once out of the oven, the air will hang heavy with irresistible aromas. Waiting is tough. Worth it, though - nobody likes a sloppy slice of tart. Plus, allowing the tart to cool just a bit means the créme fraîche quenelle placed atop each slice (in case you are feeling that - yes- this tart does require just a wafer-thins amount more of richness) will hold shape. Dice butter into medium cubes (keep cold). In a food processor start with the flour and pulse. Add the butter. Slowly add the iced water making sure to keep the butter cold and not to over-mix. Using a spatula, scrape out dough, and wrap in plastic wrap. Put dough in the fridge to chill for at least 2 hours or overnight. Pre heat the oven to 400. Once the dough has chilled take it out of the refrigerator and place it on a floured surface. Roll it out into an even 1/2 inch thickness, keeping it as round as possible. In a pie pan lay the dough and cut the uneven edges to form a round tart shell. Crimp the edges and poke holes in the bottom of the dough using a fork. Place a sheet of tin foil in the shell, filling with a cup of dry beans or rice to weight the bottom. Bake for 15 minutes, remove foil and beans/rice and continue to bake an additional 5 minutes. Sweat the onion and leeks in butter on a low simmer for 30 minutes. Stir regularly. Add fresh thyme, salt and pepper. Taste and add more salt if necessary. Stir in 3oz. of shredded gruyere cheese. Place the caramelized onions and leeks in the baked tart shell. Cover with the remaining Gruyere and bake for an additional 35 minutes. Let cool for at least 15 minutes. Slice and top with a quenelle of creme fraiche and a few fresh thyme leaves. This beer pours a deep orange with a thick creamy head. The aromatics give way to a sweet bready aroma with strong hints or grapefruit and floral hops. The flavor is similar with a sweet citrus and malt throughout. It also has a crisp finish from the carbonation. The pairing is mostly a contrast but also has some like flavor profiles. The caramelized leeks emulate the malt backbone of the beer, bringing out the sweetness in each other. Conversely, the sweetness of the leeks contrast nicely with the refreshing bitterness the hops provide. The hops also act to cut the richness of the tart, butter, and cheese.